You can print them out, cut them out, and bend them into globes. I suggest you first try Planetary Icosahedrons, which are easier to make. part 1 , 2 , 3. 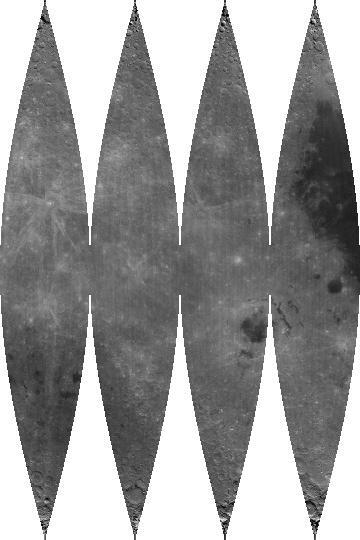 From Maps of the Solar System - Mercury. Image smaller version 0/Mercury 135k jpg. 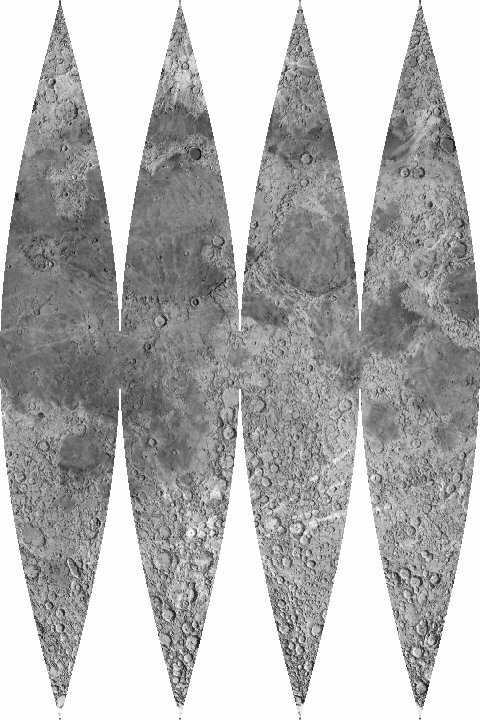 From MARINER 10 MERCURY Shaded Relief Map. 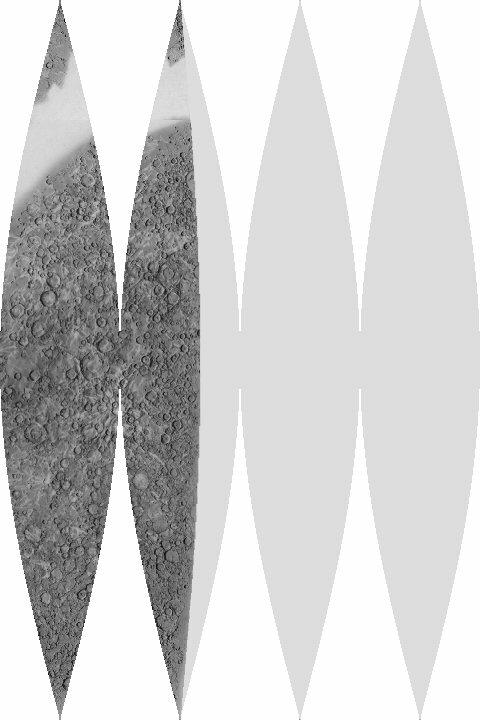 Image TIFF format Simp Cyl Proj; 10 Mbytes. 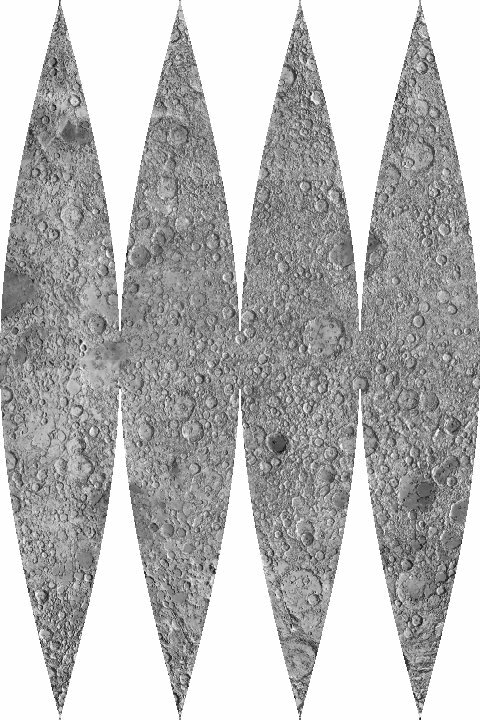 Image AVHRR Pathfinder 2048x1024 (192k). Image smaller version 512x256 (18k). Brightened slightly. Perhaps not enough. 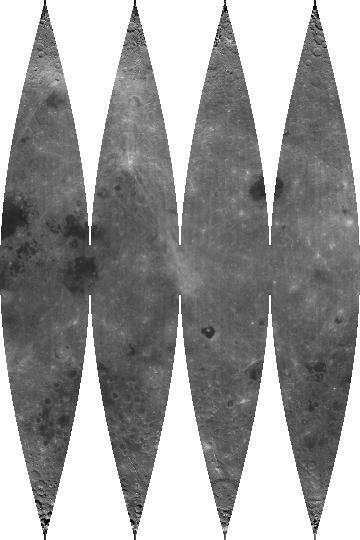 Image Clementine global albedo map of the Moon - 10 km/pixel - 204 kb [near IR]. 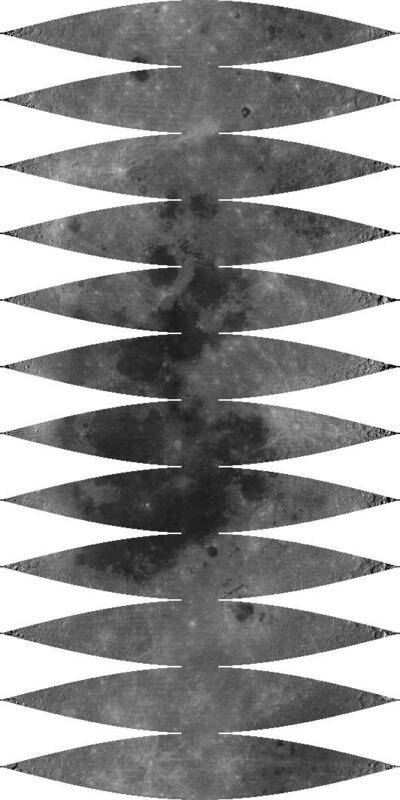 From Maps of the Solar System - Earth-Moon System. 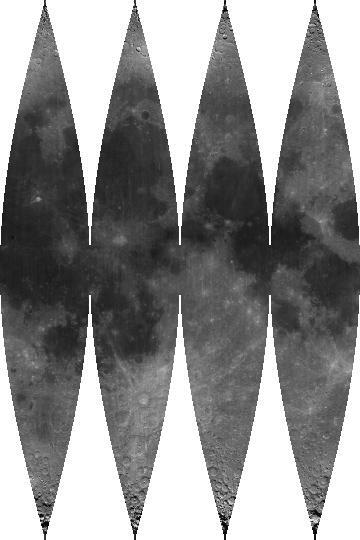 Image smaller version 1/Moon 330k jpg. 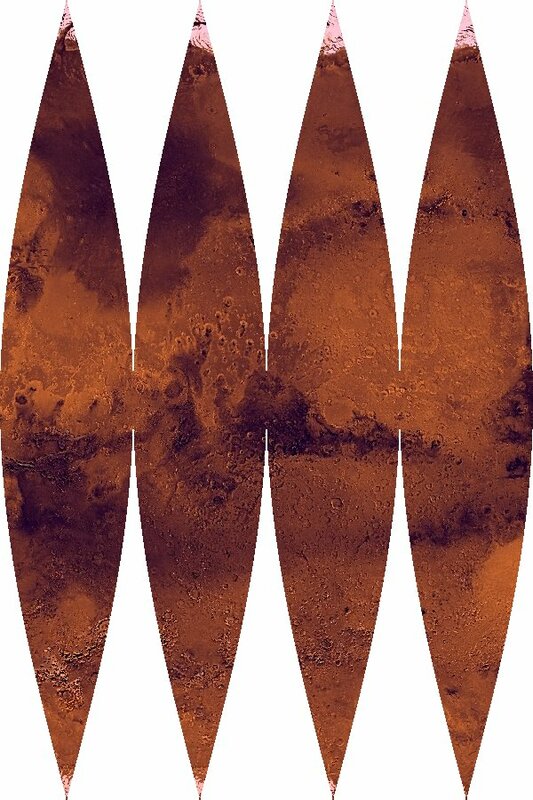 From NASA Planetary Data System MAP-A-PLANET. 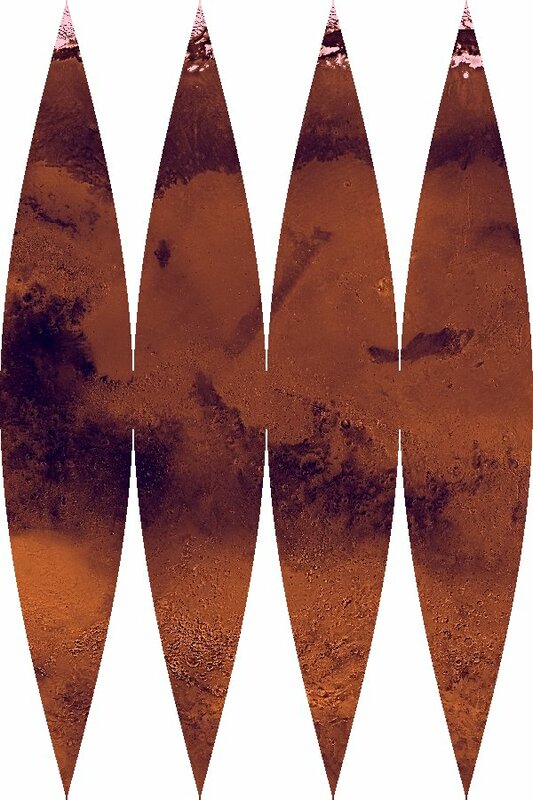 Image MAP-A-PLANET output, generated by [Mars Advanced mars_viking_merged SIMPLE_CYLINDRICAL STRETCH=NONE 5pix/deg Lat 180 Log 360]. 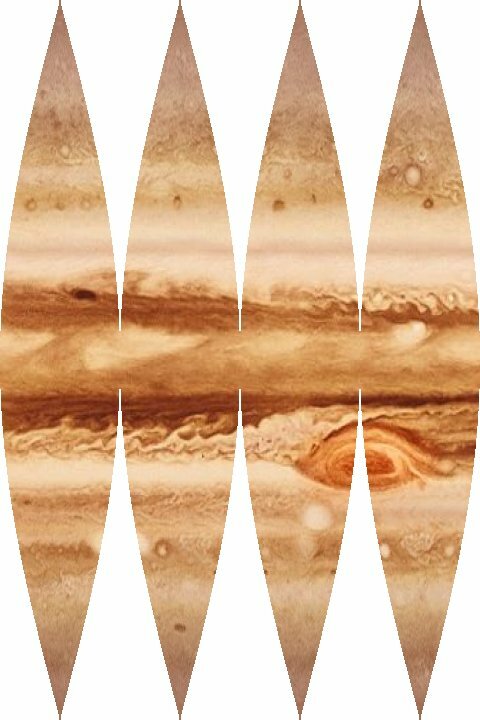 From Maps of the Solar System - Jupiter and a "C. Thomas' Planetary Maps" webpage (now gone?). 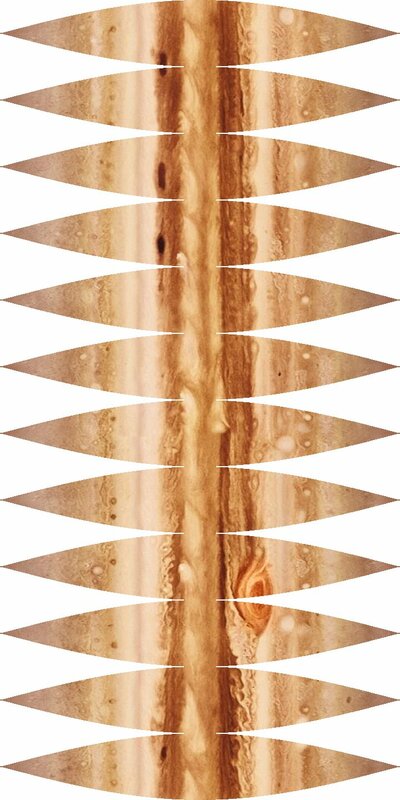 Image (2nd) Jupiter 2.4M tif. Image smaller version (2nd) Jupiter 115k jpg. But compare color with CICLOPS. 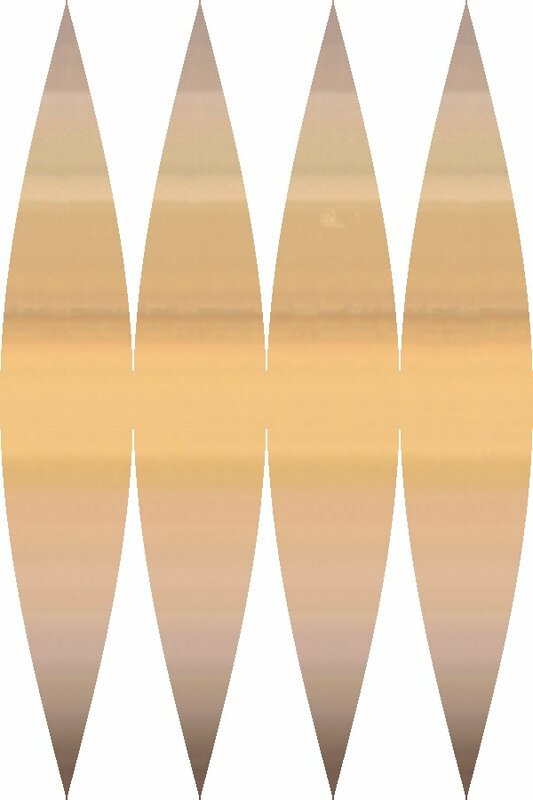 From Planetary Map's A map of Saturn. Maps of the Solar System - Neptune has an interesting fictional image, but I've been unable to quickly determine its accuracy. 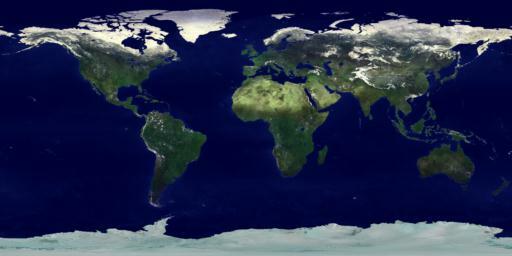 I hacked a quick GIMP plug-in, make_globe_gore_map. 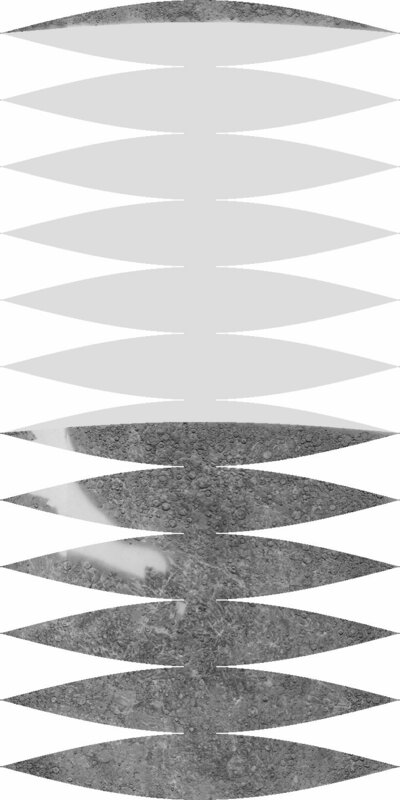 It currently uses a slow mechanism to access the pixels, so it runs veeerrrrryyyy slowly (hour-ish). Apparently doesn't work under windows. Here is an alternative script, make_gores.pl. It is much much faster, portable perl, and doesn't require gimp. It takes a raw PPM format input file, and generates a similar output file. Motivated by a reader's interest and effort -- thanks. "Io gore globe image" discussion and image. 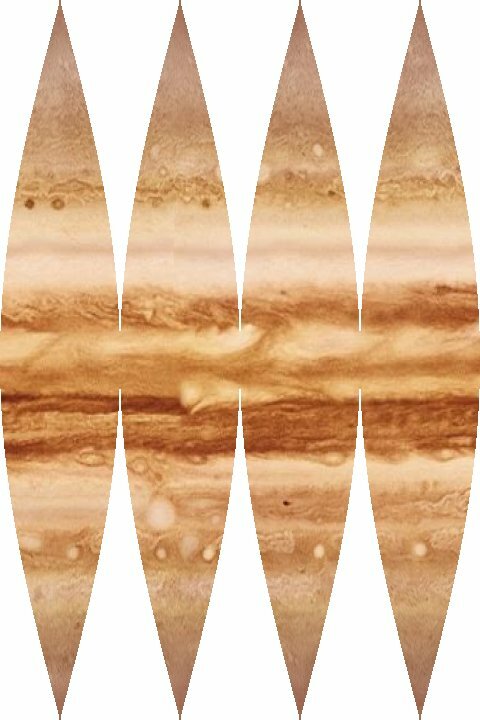 "Interrupted, sinusoidal (aka "Sanson-Flamsteed") gore map"
(Jupiter) Jupiter in True and False Color and its src page. 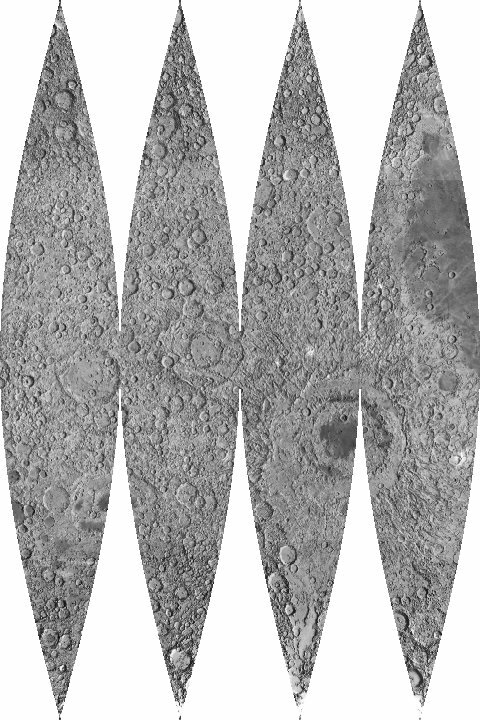 A page of maps is planned for Views of the Solar System. 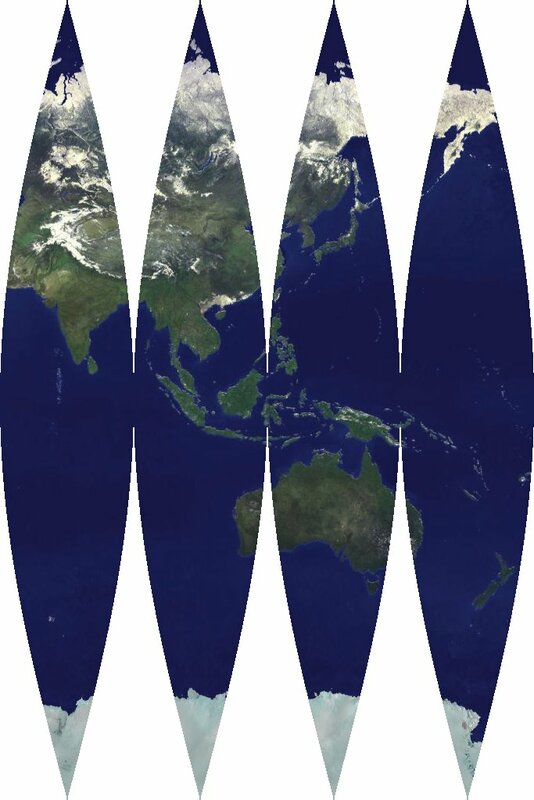 Thanks to the creators of the planetary cylindrical-projection maps. All I've done is slightly massage them. 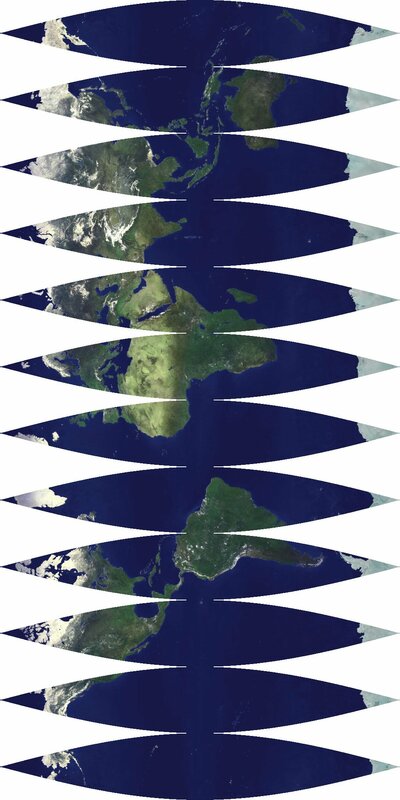 Thanks also to the reader who motivated this page, to Furuti's Map Projection Pages which showed what needed to be done, and to GIMP which did it. "I printed and measured one Mars gore as it would be stuck onto a regular REPLOGLE (earth) globe, and it fits quite nicely. Next thing is to print half-gores on AVERY full sheet size labels. For a 12 inch globe, a half gore just fits a regular 8 1/2 x 11 sheet nicely. 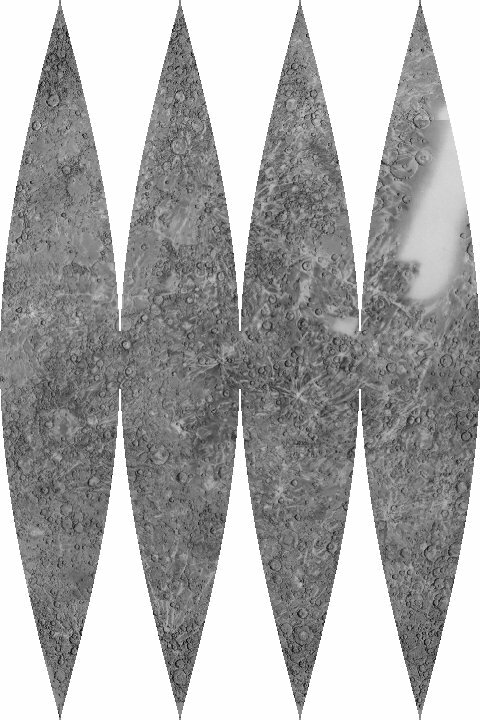 Actually, using a feature in Photoshop-7, I can create arrange 3 half-gores, one inverted, for a 12 inch globe, so little of the sticker sheet is wasted. Same can be done with any photo package with cut & paste." "I have two REPLOGLE globes - 12 inch and 16 inch. They are made of compressed cardboard, with pastic coated sticker gores. The gores on the 12 inch are 15 degrees of longitude wide, while the gore stickers on the 16 inch globe are 30 degrees wide. 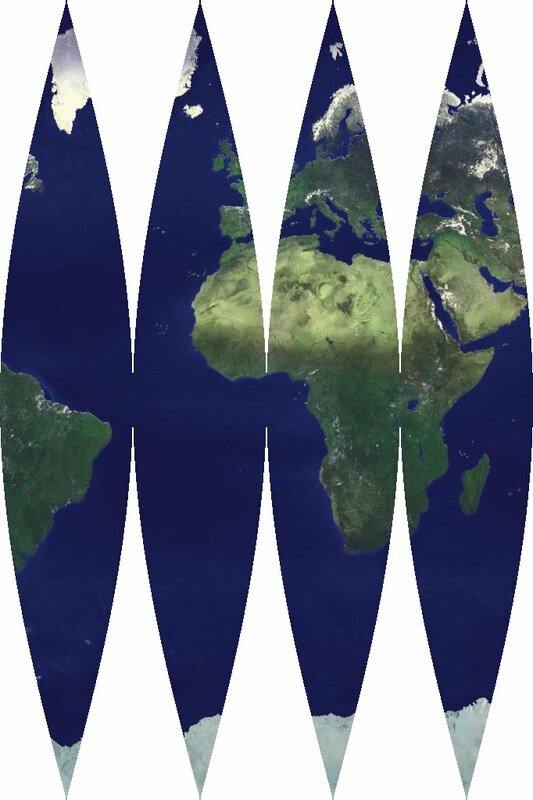 Looking very closely, I also see that REPLOGLE cut the gores, 1/4 of the gore width through on each side, at just 2 places, at about (14 and 28 degrees Latitudes) on the 12 inch model, but at 3 places, at about (14, 28, 44 degrees Latitudes) on the 16 inch model. 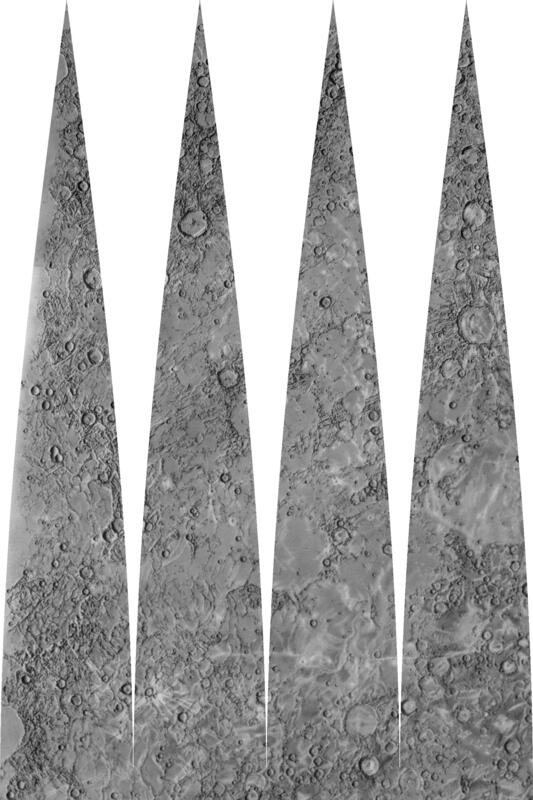 These cuts allow the gore stickers to lay flatter on the globe surface during construction. They are just the right depth and at the right height up the gore, to permit the cuts to seemlessly mesh to the sphere." 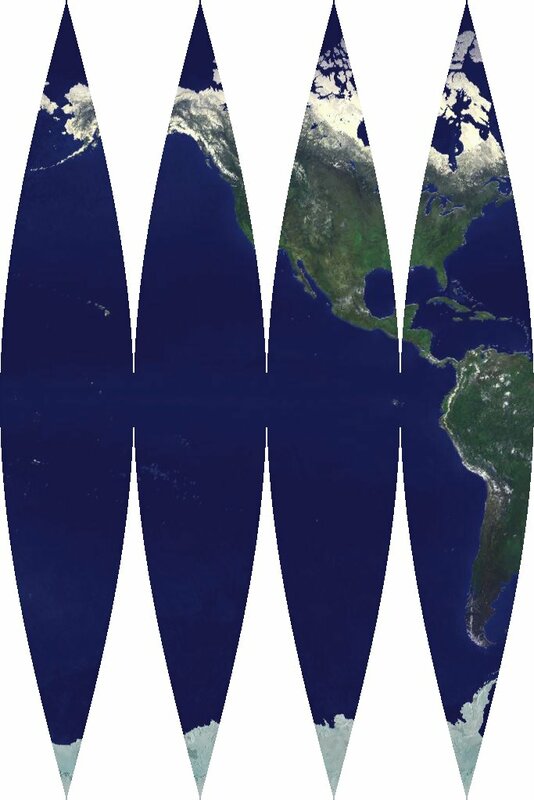 so the gores are not lined up with the n x 15 deg longitude lines. I've another version which is, if anyone cares. Mention script-fu version. Lack of perl-fu for windows. Incorporate reader's script-fu extentions into alternate script. 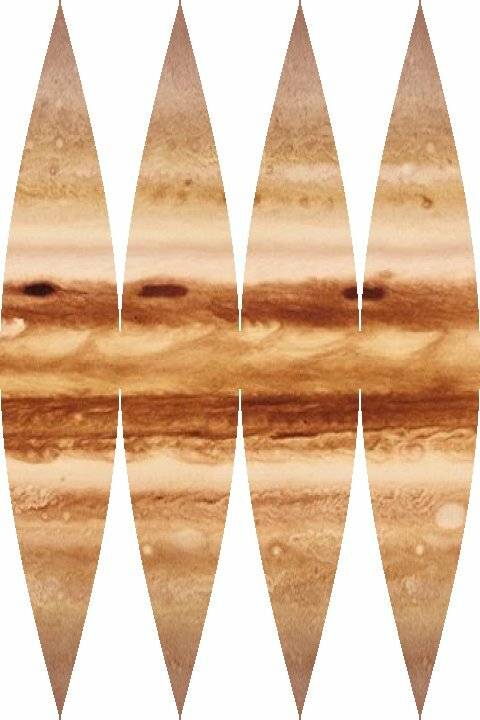 Goreify visually more accurate CICLOPS's Jupiter. Color globe generator, and placeholders for other planets. Is "C. Thomas' Planetary Maps" gone for good? Higher res earth(PM4x2), mars(gen), merc(shade_simp.tif), etc. 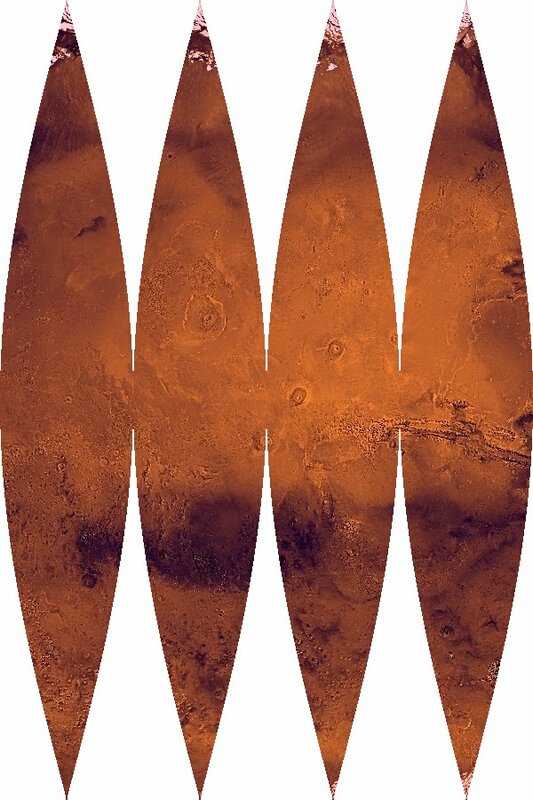 Vhighres mars, moon, calist, europ, from MAP-A. 30cm/12in globes. 12/24 g? Venus elevation map, color ball, IR. Neptune Voy img. Check Davis background. 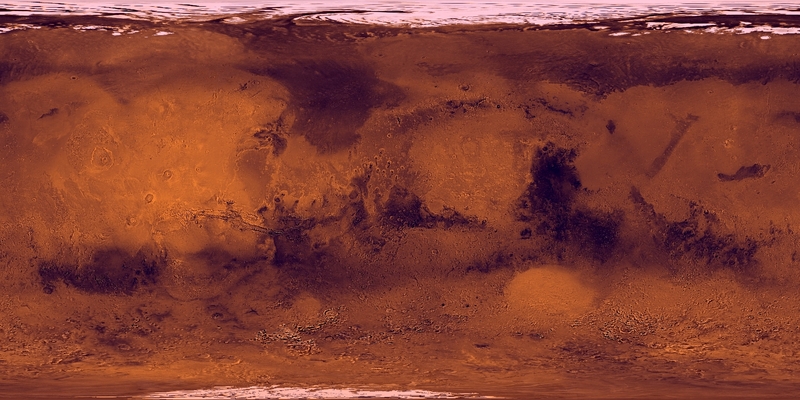 Who has Mars' color right, MAP-A-PLANET or Maps of the Solar System? 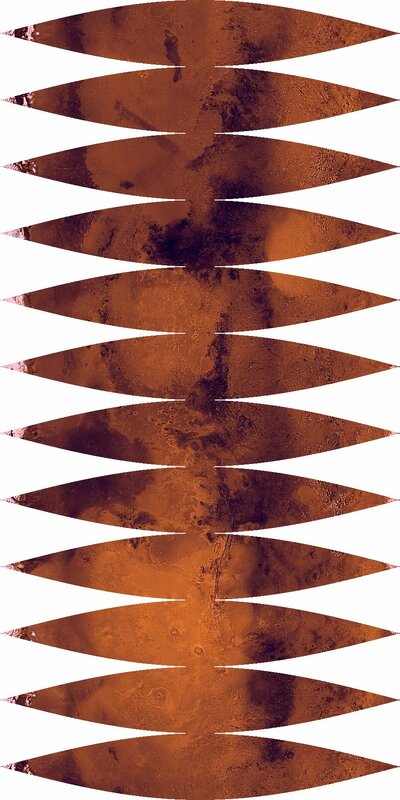 Make 2nd Mars from MotSS. I don't trust jup0vtt2's poles. 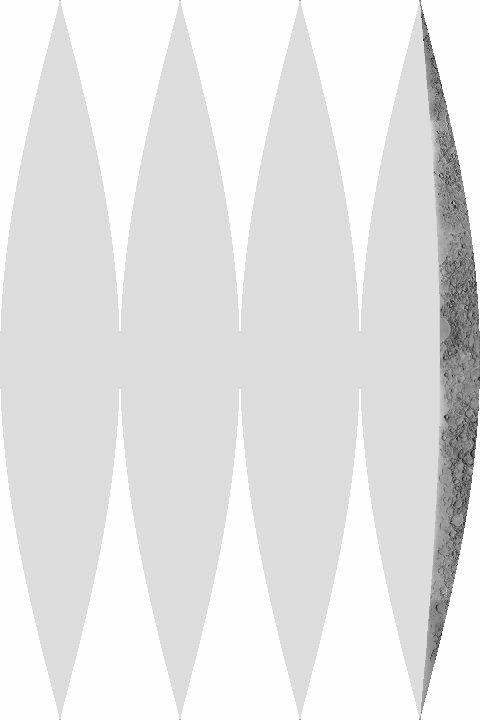 Layout - equitorial alignment mark, pole caps, core hoops, edge cut strips. Match output size/resolution to target print size, and printer res (n x 100dpi). Size specific (PDF) for various objects (tennis ball, etc). Support mercator input. Partial lat/lon coverage. 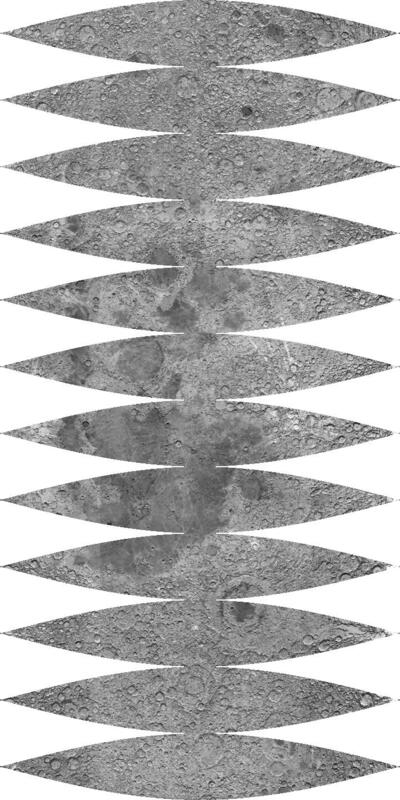 Line rather than point sampling. RGBA, GRAY* capable. Don't set resolution in plug-in? Use metric size. (Crntly 10in). Do faster PDL? version of plug-in. 2003-Dec-15  Fixed reader comments. New version of alternative script. 2003-Dec-14  Added a fast alternative script, and a reader's comments. 2002-Jun-23  Added `USGS Astrogeology: Maps and Globes'. 2002-Feb-20  Modified Mercury PDF to avoid clipped edges. 2002-Feb-20  Added high-resolution Mercury. For a reader. 2001-Dec-06  Added true-color references from pds.jpl. Thanks to a reader!